His eye is on the sparrow . . .
On my way to the chapel yesterday morning I found myself singing an old song, "His eye is on the sparrow, and I know He watches me." While I was singing, it suddenly dawned on me the importance of this confidence that comes from a real and active relationship with Jesus. 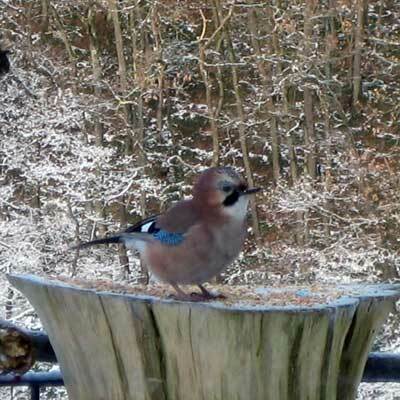 Then I remembered this photo I took of a jay that was visiting our bird feeder back in the bitter cold of December. I was surprised by how strange looking he was, and it took me a moment to see what was going on. Somehow the upper part of his beak was missing. I haven't a clue how that could have happened. It seems impossible that somehow it could have been yanked off, because something would have had to hold the rest of him against the pull. Anyway, in spite of his handicap, he seemed to be surviving quite well. I've posted a video clip that shows how he manages to eat with only half the originally-issued equipment. The Lord is taking care of him! Then, I felt the Lord showed me something about this in relationship to the coming revival. The key to its staying power will be that people will be drawn into a deeper individual relationship with Jesus by God's grace through the Holy Spirit. Gatherings of the saints will obviously have an important role, but frequent personal communion will be the source of ongoing strength for all. I believe there is a good lesson here for us. It may seem sometimes that there are too many obstacles in our path. The bible is full of examples of saints who have faced opposition. (Check out Hebrews 11 for quick overview.) But there was always a way forward, just like for this poor bird. The Lord is faithful to watch over us through thick and thin. We got a email from a dear friend in Louisiana today that was of great encouragement for us. So I thought I would just pass it along in hopes that you are blessed by it as well. I am writing you because I had a beautiful dream that connected me to the both of you. In my dream I saw a large mansion that I knew belonged to you both. When I went inside I was in this long hallway. I saw these huge portraits on the walls of farm land, wheat fields and barns. 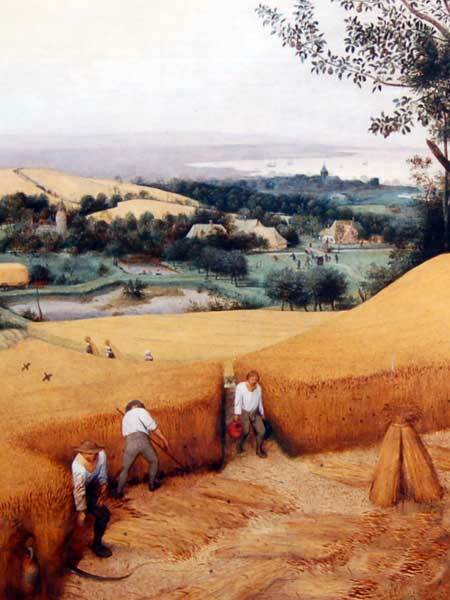 One painting I saw had an orange-red background, like a sunrise, and I saw wheat bundles. Then I saw the inside of a barn or storehouse with a purple background, like a sunset. Then the picture began to move, I saw tons of hay and grain being dumped into the barn! Whatever you are doing, the Lord is definitely watching! I know you will see this harvest soon. So for us this is another timely reminder of God's amazing faithfulness, and we are so thankful for His goodness towards us! I know that all us need a little heavenly pat on the back from time to time. Actually, I think we need them more than we like to realize. And this is where God's kindly attention towards us can be such a blessing and strength to us! This word seems so fitting to Paul's exhortation in Galatians 6:7-9, "... for whatever a man sows, that he will also reap. For he who sows to his flesh will of the flesh reap corruption, but he who sows to the Spirit will of the Spirit reap everlasting life. And let us not grow weary while doing good, for in due season we shall reap if we do not lose heart." I have been praying for my area for God to move and save people, I have been praying for a 'revival', a word which often pops up when I am praying. I decided today to look this up on the Internet - and here I find that God has sent you, and is building up intercessors throughout our land. I am very excited about all this as I now see what God has drawn me into. I too am an intercessor and have been praying for a revival. So I want you to know that I too am praying for this country of mine. We desperately need a revival and it scares me the way our country is with it's downward spiral away from God's laws. We live in frightening times - but they are also exciting times. What a blessing to know that we are all involved in this great move of God. There are thousands of saints working around the globe where souls are pouring into His kingdom. Others of us are watching and praying, working and waiting for His promises to manifest. So let's keep on pressing into His heart for this hungry and thirsty world! Have we got God's attention? Days are getting noticeably longer now, and early morning frosts are no longer a daily occurrence. Gladys is happy about that, and the ducks next door are too! So I'm glad I grabbed this shot of these miniature bunches of moss on the wall when I had the chance two weeks ago! I am always astonished by God's incredible attention to details! Each one of these tiny stalks are perfectly clad in ice crystals, each one different from the others. And they can only be appreciated for a short time before they melt away. What a simple gift to see! And on another level, how much greater detail and attention is dedicated to each of us, God's human creatures? 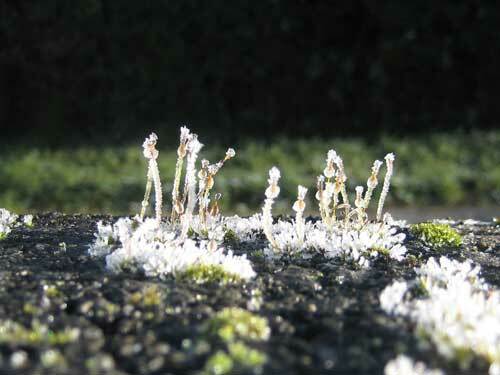 The lifespan of the frost, or the moss, is miniscule in comparison to ours. And yet each of us have His attention in a way that is impossible to truly comprehend. Now let's take another step into a larger scale yet. This is a composite view of man's movements through the skies of today's world. Each yellow dot is an airplane full of people. 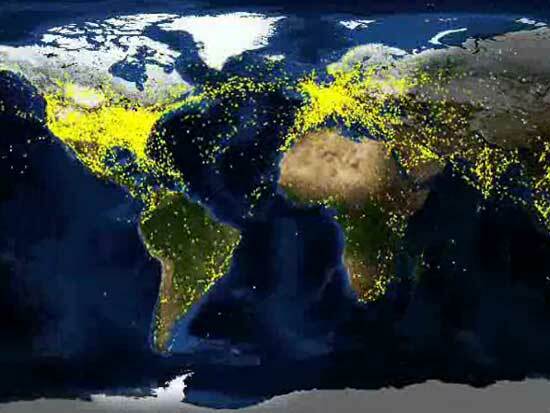 And here is a link to the video that shows a 24 hour observation by satellite of all of the large aircraft flights in the world, squeezed into just 1 minute 11 seconds. It is a real eye opener. It takes thousands of air traffic controllers to keep an eye on all this activity. Sound like a big job? Now, just as the Lord was pending on David's every thought and action, so He is with each one of us. And not only that, but every single person on this planet, 24/7. Paul says in Romans 11:33, "Oh, the depth of the riches both of the wisdom and knowledge of God! How unsearchable are His judgments and His ways past finding out!" What an amazing God is He that loves us and gave His Son for us, that we might become His sons and daughters! One of the things that most impressed me while watching this video is this marvelous fact. When the Revival that we are praying and believing God for begins to break out, you can get an idea of just how fast it can spread around the globe! Isn't that exciting? Just imagine the saints of God, boiling and bubbling over with the power of the Holy Spirit in their lives, getting into these airplanes! Remember how almost everywhere Jesus went, multitudes gathered to Him? And so when when we, His body, start doing "greater things" through His power, zipping back and forth around the globe, it is going to be pretty wild. So there's something else to be praying about. Are we getting ready?